Please note that there will be NO Latin Mass at St Charles Church in Hull on Wednesday 3rd January. I am not sure whether first Wednesday Masses will resume, so please keep an eye on this blog. Starting on Sunday 14th January, Fr Mark Drew will be offering a Low Mass on the second Sunday of each month at the Church of St Mary and St Joseph in Hedon. More about this, including the time, later. There will be a Rorate Mass at St Wilfrid's Church in York at 7am on Saturday 23rd December . It will be in the side chapel of St Philip Neri. A Rorate Mass is an early morning Mass of Our Lady offered in Advent and is usually by candlelight. It takes its name from the opening words of the Introit. Breakfast is being provided after this Mass, but must be pre-booked. See the parish website for details. There will be a Solemn Mass in the Extraordinary Form at St Wilfrid's Church, York at Midnight on Christmas Eve. It will be preceded by the singing of carols. So far as I am aware, this will be the only EF Christmas Mass in the Diocese of Middlesbrough this year. "Teachers should know how to speak to the hearts of young people, know how to treasure the very rich heritage of the Latin tradition..."
As is usually the case with Pope Francis, he talks around the subject, dropping in suggestions and inferences, but not being very clear about what he actually means. Many reporters have interpreted the pope's message as encouraging the teaching of Latin, especially to young people. Friday 8th December is the Feast of the Immaculate Conception. 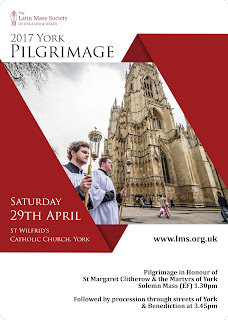 There will be a Solemn Mass in the Extraordinary Form at St Wilfrid's Church in York at 6pm to mark the occasion. The Next Latin Mass in Hull will be at 6.30pm at the Church of St Charles Borromeo on Wednesday 6th December. There have recently been a few posts on various blogs concerning the numbers of men putting themselves forward for training for the priesthood, and the number ordinations of diocesan priests. Everyone is agreed that there are acute shortages in most dioceses, and that matters will get worse in the years to come. Some people have commented that many of our bishops have failed to grasp the problem, saying such things as "it is in the hands of the Holt Spirit". My view is that the bishops of England and Wales now take the matter seriously, but perhaps some have not done so in the past. However, I believe that many of the bishops of England and Wales have yet to adopt the remedial measures that are needed. I believe that over the past 40 years, there has been a significant number of young men who have felt a call to the priesthood, but have been put off by what they see in their parishes. I believe there have been many others who have spent one or two years in a seminary, before deciding that the seminary lifestyle is not for them. There is yet another category of potential priests who have applied to their bishop, and been told to go away and think about it for a year or two. It is likely that in most of these cases, the candidate has had a more traditional concept of priestly life than either they had observed in their parishes or in seminary. In some cases it may have been the bishop who felt unable to accept a candidate, usually because the candidate is perceived to show traditional leanings. My belief is that, if over the last 40 years the Church had been more welcoming to these candidates, the priest shortage within our dioceses would be far less acute - possibly to the extent of 200 or more diocesan priests. What leads me to think along these lines? Firstly, I have personally come across more than a few young men who would seem to fit this scenario; and there must be many more unknown to me. Secondly, we have the evidence of the traditional orders that are now establishing themselves in this country. Yesterday I met one young man who had just returned from a weekend in Warrington where he had been discerning his vocation with the Priestly Fraternity of St Peter. He told me that he was one of seven. At Preston, the Institute of Christ the King have just set up a House of Discernment, and five young men have chosen to spend a year there. This shows a high level of commitment, as in most cases it has involved giving up job or perhaps an entire career. My third bit of evidence is the recent growth in the number of Oratories in this country. In recent years, Orarories have been formed in Manchester, York, Bournemouth and Cardiff, and between them, they have attracted at least six novices. 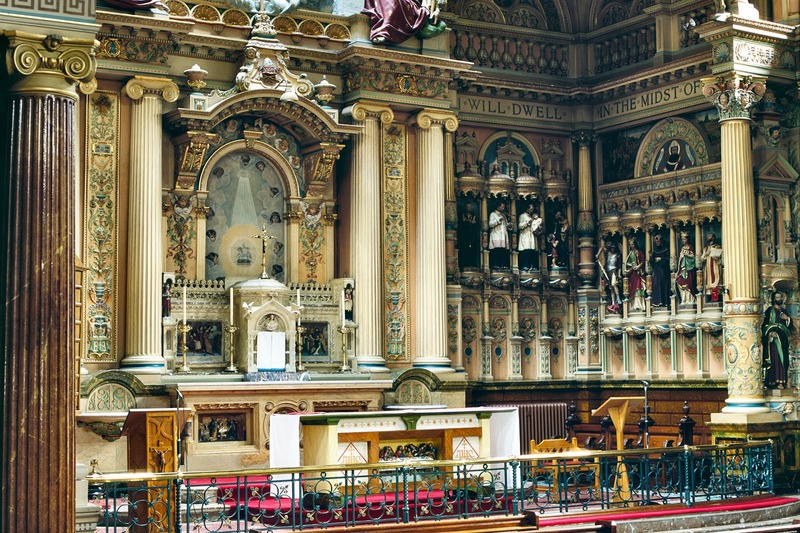 The Oratory communities are traditional in their lifestyle and offer the Latin Mass in their churches. So what conclusions do we draw? Firstly, the priest shortage in the dioceses need not have been as severe as it is; and the dioceses could still attract more priestly vocations if the more traditionally minded candidates were made more welcome. Reform is particularly needed in our seminaries. The second conclusion is that the traditional orders will be playing an increasingly important role in the Catholic life of this country in the years to come. There will be a Solemn Pontifical Mass of Requiem at 3pm on Saturday 11th November in St Anne's Cathedral, Cookridge Street, Leeds. The celebrant will be His Lordship the Bishop of Leeds, Marcus Stock, and the Mass will be offered for for his predecessors as Bishops of Leeds. Neil Walker dis supply me with an attractive poster for this event, but I am unable to include it here, for reasons that I do not understand. Nevertheless, it will be a momentous occasion, and I would urge anyone able to attend to tavel to Leeds for the event. Saturday 4th November is the Feast of St Charles Borromeo, and there will be a Sung Mass at St Charles Church, in Hull at 12,10pm. The celebrant will be Fr Mark Drew, and the musical setting will be Byrd's Mass for Four Voices, sung by the Rudgate Singers. For those who do not know the church, the interior of St Charles' Church, which dates from the time of the Catholic Emancipation, is impressive, with many statues of saints. The Mass is being billed as one of Hull's City of Culture events. There will be Latin Masses at 6pm at St Wilfrid's Church in York on both Wednesday and Thursday of this week for the feasts of All Saints and All Souls. There will be NO 6.30pm first Wednesday Latin Mass at St Charles' in Hull on 1st November as there is no priest available. There will, However be a Mass on Saturday 4th November at 12.10pm to mark the Feast of St Charles Borromeo. See next post. Papa Stronsay, the blog of the Transalpine Redemptorists, has a splendid post which includes the following picture. 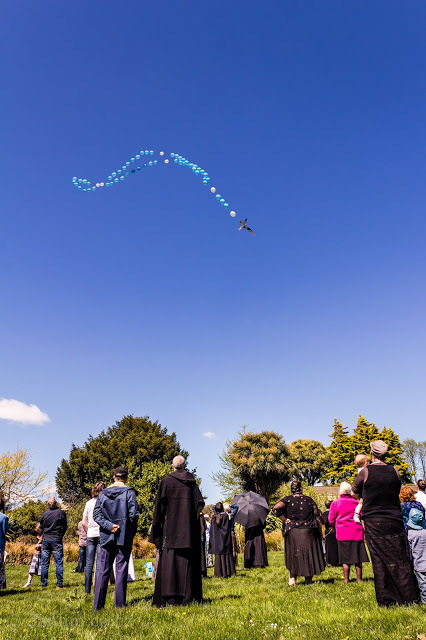 At their Oratory in New Zealand, they made a rosary from gas filled baloons, and released it into the sky to mark the centenary of the apparitions of Fatima. Apparently it rose until it could not be seen any longer. Presumably, the baloons eventually burst, and the rosary landed somewhere, although there is no account of it being found. I have recently come across some statistics about priestly ordinations in France. These figures are for diocesan ordinations only, and exclude all traditional and religious orders. What I was not aware of, is the increasing practice in France of diocesan priests being ordained according to Extraordinary Form rites. The following figures cover the years 2010 to 2015, and so are not fully up to date. Taking the six years together, about 16% of diocesan ordinations have been in the extraordinary Form. The most noticeable feature of these figures is the downward trend in the numbers being ordained in the Ordinary Form. Although there is no marked trend in the numbers being ordained in the Extraordinary Form, the trend in this percentage of EF ordinations is definitely upward. As far as I am aware, there is no example in England and Wales of any diocesan priest having been ordained in the EF in recent times, although Archbishop McMahon has ordained two FSSP priests, using the old liturgy. 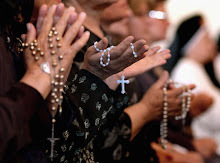 A relatively new phenomenon in France is the bi-ritually trained diocesan priest. I presume that most of these opt for ordination in the EF, and represent most of the EF ordinations enumerated above. When one adds the ordinations of Frenchmen belonging to the FSSP, ICKSP and IBP into the mix, and also takes into account the traditional Benedictine and Augustinian monasteries in France, which are prospering, the proportion of ordinations in the Extraordinary Form is quite impressive, probably 40% at the present time. There will be no Latin Mass at St Charles Church in Hull on Wednesday 1st November. This is because there will be a Solemn Mass at St Charles Church at 12.10pm on Saturday 4th November to mark the Feast of St Charles Borromeo. There will be more about this in a future post. 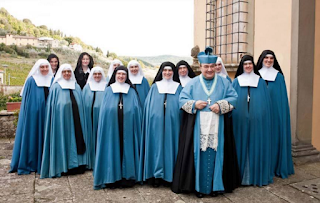 It has recently been reported that the Sisters Adorers of the Royal Heart of Jesus Sovereign Priest, who form the female branch of the Institute of Christ the King Sovereign Priest, are to open a convent in Preston, Lancashire. They are to take over the former presbytery of the now demolished Church of St Augustine. Here is a picture of the former presbytery, with the remains of St Augustine's Church in the background. It was a large presbytery, and there is a sizable garden behind the wall in the foreground. St Augustine's was one of several large Catholic Churches built in the central area of Preston in the nineteenth century. The foundation stone of this classically designed church was laid in 1838, and it remained in use until 1984, when dry rot was discovered. 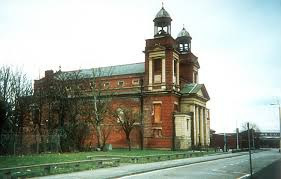 By this time, much of Preston's population had moved to new housing estates in the suburbs, with the result that the central churches were heavily underused. The discovery of dry rot was given as the reason for the immediate closure of the church, although it remained standing until 2004, when it was demolished, although its classical facade and the presbytery were preserved. The site of the church is now part of Newman College, into which the classical facade has been incorporated. The presbytery remained in occupation until 2015. It is now to have a new life as the home of the Sister Adorers of the Royal Heart of Jesus. They are a non-cloistered order of contemplative nuns who will give support to the two churches in Preston served by the Institute of Christ the King. I have recently read that East Timor, which has a population of 1.3million people, is 97% Catholic. There are currently 220 priests, which amounts to one priest to serve around 6,000 Catholics. In the past East Timor has relied heavily on missionary priests supplemented by a few priests born in East Timor but educated elsewhere. Things are beginning to change. In the year 2000 a seminary was opened in Dili, and this has been supported by a junior seminary. The junior seminary has been accepting 90 students each year, but has to turn away most of the 300 or so that apply. This year a second junior seminary has opened that is able to accept 22 students. Although a welcome development, further junior and major seminaries will be needed to satisfy the demand. There is the potential for the number of priests to increase dramatically in the years to come. There will be a Low Mass in the extraordinary form at St Charles Church in Hull at 6.30pm on Wednesday 4th October. The celebrant will be Fr Peter Mulholland. Bishop Stock will be conferring the sacrament of Confirmation in the Extraordinary Form on Wednesday 23rd November at 7pm in the Church of St Joseph in Bradford. Opportunities for Confirmation in the EF rarely occur in the northern dioceses, so this is an occasion not to be overlooked. I suggest that candidates who have been properly prepared (or their parents) should contact St Joseph's Church (01274 720299). 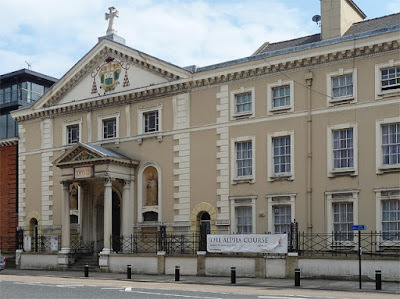 I shall be travelling to Preston on Sunday to attend a Pontifical Mass celebrated by Bishop Michael Campbell of the Diocese of Lancaster to mark the transfer of the Church of St Thomas of Canterbury and the English Martyrs to the care of the Institute of Christ the King Sovereign Priest. It will become a shrine of the English Martyrs. 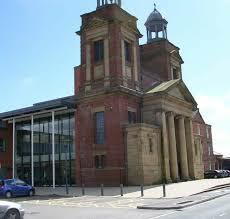 The Mass will be at 11.30, and the church is situated just to the north of the city centre on the Garstang Road. The church was built and later extended by Edward Welby Pugin, son of the great AWN Pugin, and remains very much unchanged. I look forward to seeing the inside. I have recently returned from the Summorum Pontificum Pilgrimage to Rome. Although I travelled by myself, I was able to join about 2000 other pilgrims from all parts of the world for Mass in St Peter's Basilica last Saturday. For me the pilgrimage started on the Thursday evening with Mass in the church of Santa Maria supra Minerva where Mgr Wach of the Institute of Christ the King was the celebrant and preacher. I was not able to attend the the Way of the Cross on the Friday as it would have involved too much walking, so instead, I took the Metro to the basilica of San Giovanni and was able to join a guided tour. I did, however, join the procession on the Saturday from the Chiesa Nuova to St Peter's. In the afternoon, I visited the basilica of Santa Maria Maggiore. On Sunday, I was able to attend Mass at the church belonging to the Priestly Fraternity of St Peter. This was a Solemn Mass in the Dominican Rite, which was a new experience for me. The Future of the Anglicanism in Britain. Every year since 1983, an organisation called the National Centre for Social Research has conducted its British Social Attitudes Survey. In almost every year, it has included a question asking respondents about their religious affiliation. The most conspicuous trend over the years has been the growth in the proportion of people who say that they do not associate themselves with any religious denomination. They have grown from 31 percent in 1983 to 53 percent in 2016. This would indicate that the Catholic Church will overtake the Anglican Churches as the largest denomination around the year 2023. Unfortunately, I cannot reproduce the graphical representation here, but I can assure you that it is very convincing. The national pilgrimage statue of Our Lady of Fatima will be visiting St Wilfrid's Church in York between 11th and 13th September. As part of the programme of events, there will be an Extraordinary Form Mass at 6pm on Tuesday 12th September. Relics of the visionaries, St Jacinta and St Francesco, will be present for veneration. The Catholic Bishops' Conference of England and Wales has announced that two Holy Days of Obligation are to be reinstated. The Feasts of the Epiphany and of the Ascension are in future in England and Wales to be on the actual day, and not on the nearest Sunday. An exception will be when the Epiphany (6th January) falls on a Saturday or a Monday, in which case it will continue to be celebrated on the Sunday. The Ascension will always be celebrated on the Thursday which falls 40 days after Easter Sunday. This decision is to be welcomed. When, in 2006, the Conference decided to transfer these two feasts, together with Corpus Christi, it was met with a great deal of protest, with many public letters of objection being published. I think that this must have taken the bishops by surprise, as an undertaking was taken to review the decision. There then followed more than ten years of silence, despite the occasional enquiring letter. Most people had concluded that that the bishops had no intention of reversing the decision, so the recent announcement has come as a surprise to many of us who have been campaigning for a review. Interestingly, our bishops have not reinstated the Feast of Corpus Christi to its traditional date. Why should this be? One possible explanation is that the bishops wanted to avoid a complete reversal of the earlier decision, thinking, maybe, that a partial retraction would not look like such a big climb down. This could also be the reason for the long delay. Nevertheless, many people will find it difficult to understand how it can be right that the obligation to attend Mass applied up to 2006 and after 2017, but not between these dates. There is another practical point that affects Latin Mass provision. 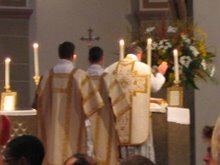 In the last ten years, many priests who are supporters of the Latin Mass, have taken the opportunity of transferred Holy Days to celebrate Latin Masses on the traditional day of the feast. It will be interesting to see how many of these continue to do so, as it is likely that there will be some pressure on them to offer English Masses on these days. I wrote in the previous post that the Diocese of East Anglia will shortly have 12 seminarians, and suggested that this may be more than any other diocese in England and Wales. I was wrong. According to the Catholic Herald, the Diocese of Portsmouth will have 14 seminarians at the start of the new term. This is said to be the biggest number for the diocese in living memory. It is unusual for any diocese to give much publicity to the number of their seminarians, possibly because the numbers are depressingly small. A quick search on the internet has not revealed any figures for other dioceses, although the website of Oscott College does list their current students giving their home diocese. The article in the Catholic Herald says that in recent years there have between 30 and 40 new seminarians each year, although in 2016 the number dipped to 26. If the news from East Anglia and Portsmouth is anything like typical, there could be a bumper crop of new seminarians this year. I suspect that it is more a case of these two dioceses being exceptional. 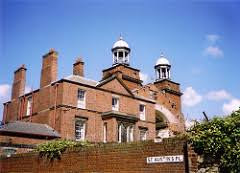 Portsmouth is, of course, headed by Bishop Egan, who has gained a reputation as a excellent bishop and one who is very sympathetic to tradition. Similarly, Bishop Hopes of East Anglia, has also proved to be friendly to the Latin Mass. Probably, the correct conclusion is that dioceses where the bishop is friendly to tradition tend to be more successful in attracting vocations. I would be interested to hear from anyone who has information about the numbers of seminarians in other dioceses. During our pilgrimage to Walsingham, we received a visit from Bishop Alan Hopes. In fact, he joined the 80 weary walkers for an evening meal at Great Massingham on the second day. The bishop took great trouble to to speak to everyone, which was much appreciated. Bishop Hopes seemed particularly happy to announce that the Diocese of East Anglia was taking on six new candidates for the priesthood in October, bringing the total number of seminarians in the diocese to twelve. I suspect that this will be the greatest number of seminarians for any diocese in Britain, and probably the greatest number of seminarians that the Diocese of East Anglia has ever had. I believe it is only a few years ago that there was only one seminarian in the diocese. Ever since the Diocese of East Anglia was created in 1976, it has been recognised as a diocese with an acute shortage of priests. Bishop Hopes seems to be rectifying this problem. Other dioceses would do well to take note of how East Anglia attracts so many seminarians. I have just returned from the Latin Mass Society's Pilgrimage to Walsingham. 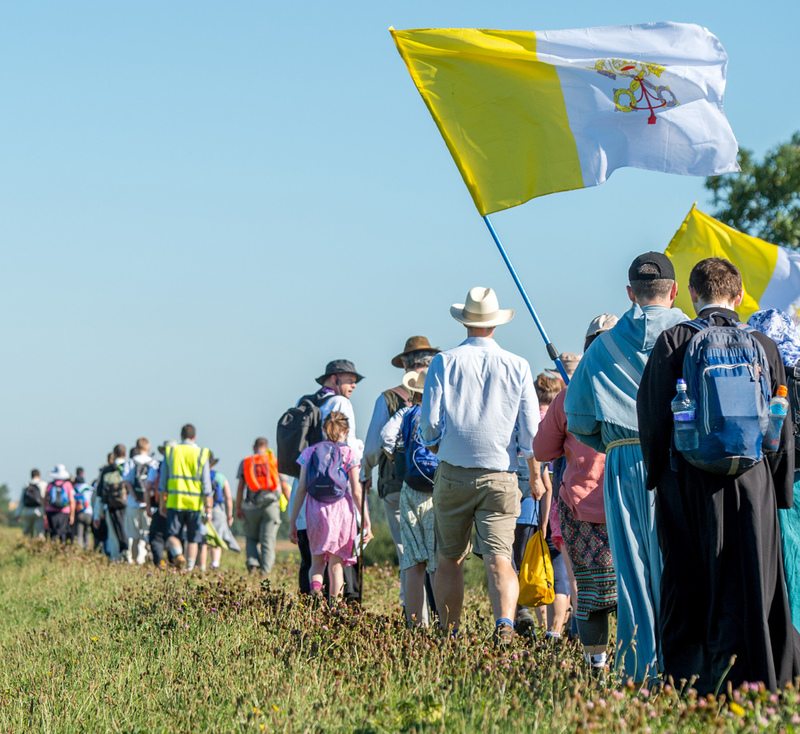 Around 80 pilgrims walked the 57 miles from Ely to the Shrine of Our Lady of Walsingham. This took two and a half days. They arrived in time to join about 100 day pilgrims for a Solemn Mass in the Chapel of Reconciliation on Sunday afternoon. This was followed by a procession along the Holy Mile to the Abbey grounds, where there were further devotions. At the end of the pilgrimage, Fr Michael Rowe, who was chaplain to the pilgrimage, and had travelled from Australia for the event, said that, "of the 50 walking pilgrimage that he had attended in different parts of the world, this one was the best". Remember to book into next year's Walsingham Pilgrimage, which will take place over the August Bank Holiday weekend as usual. I have been informed that Sunday Latin Masses at Hedon will start next January, and not in December as previously indicated. Starting on 10th December 2017, there will be a monthly Sunday Mass at the Church of St Mary and St Joseph in Hedon, to the East of hull. It will be at 5pm on the second Sunday of each month, with Fr Mark Drew as celebrant. This has been made possible because Fr Drew will be moving to Hedon in October. It is to be hoped that this new venture will be sufficiently well supported to justify an increase in the frequency. It has been my ambition for a long time to to have regular Sunday Masses in the Hull area, but the lack of priests willing and able to say Mass in the extraordinary form has prevented this up until now. We must be very grateful to Fr Drew for providing this opportunity. The Latin Mass Society's annual pilgrimage to Walsingham will be taking place over the August Bank Holiday weekend. Those intending to walk from Ely to Walsingham (58 miles) will assemble at Ely on the evening of Thursday 24th August, where overnight accommodation is provided. The walk takes two and a half days, with pilgrims arriving at the shrine in Walsingham at about noon on the Sunday. There will be Solemn Mass at 2pm in the Chapel of Reconciliation, followed by a procession along the Holy Mile to the Abbey grounds where there will be further devotions, which will end at about 5pm. Bookings for the walking pilgrimage are made on line via the Latin Mass Society website. There is no need for anyone wishing to attend only the Solemn Mass and Procession in Walsingham to book. Supporters of the Latin Mass are encouraged to make their own way to Walsingham on the Sunday. Wednesday 2nd August is the Feast of St Alphonsus de Liguori, Bishop, Confessor, Doctor of the Church, musician and founder of the Redemptorist Order. There will be a Latin Mass at 6.30pm at the Church of St Charles Borromeo, Jarratt Street in Hull. The celebrant will be Fr Peter Mulholland. 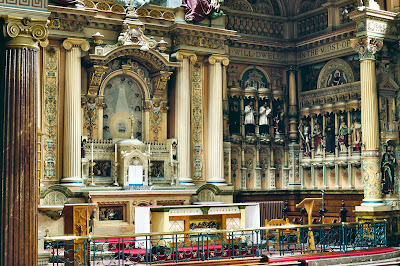 The next Latin Mass at St Charles Church in Hull will be at 6.30pm on Wednesday 5th July. It will be a Low Mass and Fr Peter Mulholland will be the celebrant. There will be a Solemn Latin Mass for the Feast of the Ascension at 6pm in St Wilfrid's Church, York on Thursday 25th May. 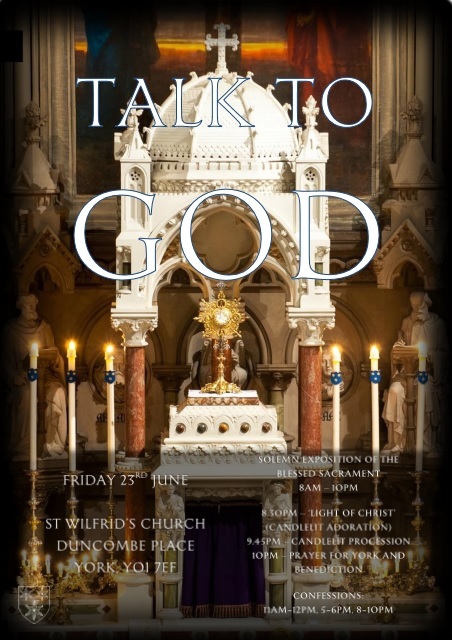 St Wilfrid's choral scholars and schola will be singing. REGRETTABLY, DUE TO THE UNAVAILABILITY OF A PRIEST THE 6.30PM MASS IN HULL ON ASH WEDNESDAY HAS HAD TO BE CANCELLED. THERE IS A LATIN MASS AT ST WILFRID'S IN YORK, WITH DISTRIBUTION OF ASHES, ON ASH WEDNESDAY AT 6PM. Ash Wednesday falls this year on the first Wednesday of March and so there will be a an Ash Wednesday Mass in Hull. Ashes will be distributed at this Mass, which is at 6.30pm on Wednesday 1st March at St Charles' Church in Hull. The celebrant will be Fr Drew.